Hello guys! 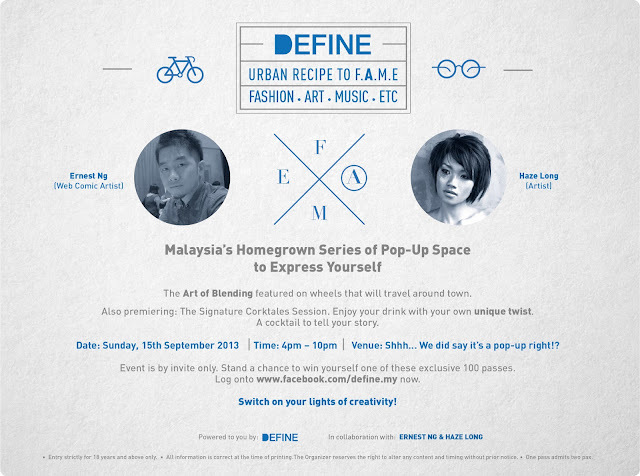 Mark your calendar for one of its kind "DEFINE - Urban Recipe to F.A.M.E" on this coming 15th September 2013 (Sunday)! Just so you know that DEFINE - Urban Recipe to F.A.M.E is a series of events that advocate self-expression through the urban indulgence such as Fashion, Art, Music etc. It is a series of parties that would allow its Guests to freely express themselves thus empowering them to truly DEFINE the party themselves. To kick off its first out of five events, DEFINE will be starting with an "Art Jamming Party" which is based on one of our key urban indulgence: Art. This Art Jamming Party will kick off on Sunday, 15th September 2013 from 4pm to 10pm. This event will be held in collaboration with several well-known artistes in Malaysia. Am kinda looking forward to the event for the activities they have prepared. The key engagement of the party will be "Art Jamming on Wheels" based on the theme of "Urban Indulgence". Guests will be creating an art piece together with our artists on a "mobile-canvas". The "mobile-canvas" will be cruising on the streets hence, showcasing the final artwork of self-expression around Malaysia. The author of one of the most popular web comics in Malaysia, "Bro, Don't Like That La Bro." – Ernest made a name for himself by publishing hilarious tales of the mischiefs and shenanigans of himself and his housemates. 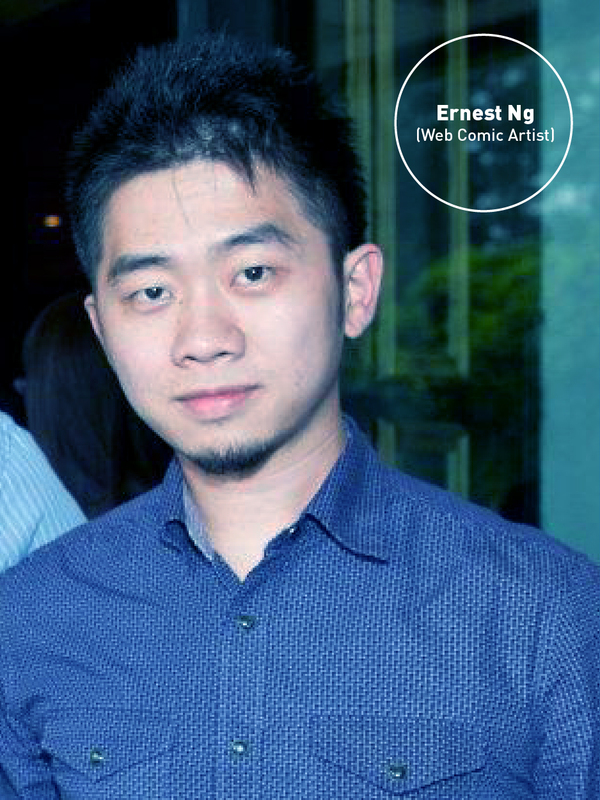 His attempt to embarrass his best friends to the fullest landed Ernest multiple features on mainstream media and recognition including winning the Digi Blogger Of The Year 2012 award. He will be coming to DEFINE to zest in his flavour of urban indulgence through the mobile canvas and you can get a chance to be drawn by him as well! All you need to do is tell them your favorite drink, and how you would make it uniquely yours, with your own recipe. Include your story behind how you discovered or concocted your unique drink. You will stand a chance to have your very own drink named after you, to be featured in this event. Express yourself through your drink and have everyone else in the party to enjoy it. All DEFINE events are exclusive and strictly by invite only. To stand a chance to win yourself invites to the party of self-expression, register at www.facebook.com/define.my before 8th September 2013. Limited to only 100 passes of invites, one pass admits two pax.